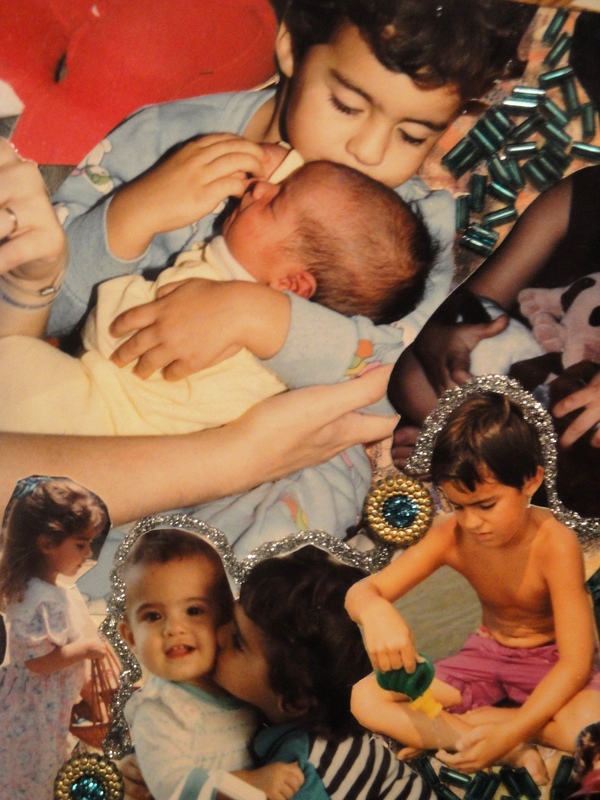 …new adventures in my art in mixed media collage. My grandmother would be proud that her basic sewing lessons weren’t a complete waste of time. These are a few of my favorite things: sea glass, golden threads and beads, flowers all in a sea of blue. “Mandala” is the ancient Sanskrit word for circle and the art of making mandalas has many benefits for centering and contemplating wholeness. This is a technique I learned in graduate school for the art therapy program I was in that I have used personally and professionally for many years. Mandalas are becoming more common than when I studied in the mid-80’s and I am glad to see that many people are discovering the benefits of making them for improving focus, reducing stress and anxiety, alleviating depression and experiencing a calm, relaxed state of mind. In past years of counseling with children and teens, making mandalas was a frequent tool that my clients preferred to traditional talk therapy and one that I found works well with groups too. It really is a simple activity to start with a circle and a pen at the very center to create a design that fills up the white space. This one has watercolors added to it but they can be made with any sort of art materials. There are pre-printed templates for coloring that are a great way to start but I prefer to make my own starting with the empty circular shape. There are many books and workshops with professionals available to learn more about this ancient activity that originated in Hinduism and Buddhism where the mandala was viewed as a symbol of the Universe. Many approaches to making mandalas and common uses of the practice view the mandala as a reflection of the Self. One book I love is Mandalas by Judith Cornell; and another is, Creating Mandalas: For Insight, Healing, and Self–Expression by Susanne E. Fincher. There are many more, just google mandalas and try it sometime! 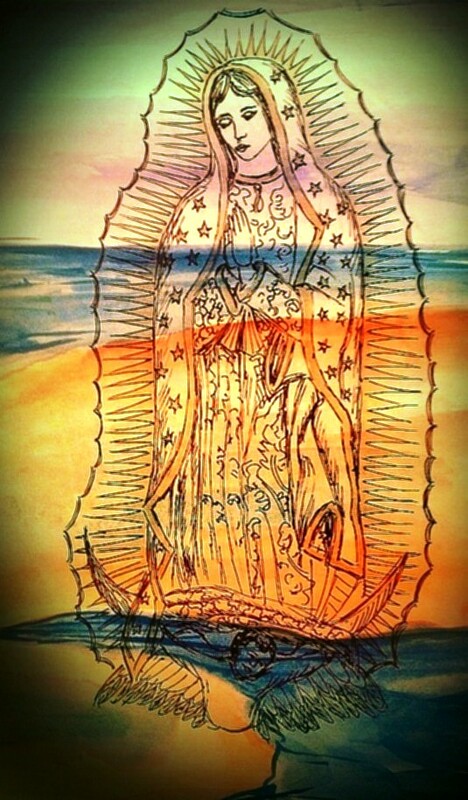 Many years ago I drew a picture of Our Lady of Guadalupe for a Catholic women’s group. The image was an introduction to Mary the Mother of Jesus in a way this Protestant never knew and led me to hang a print of Her by my bed. Recently, I felt moved to draw Her again and honor Her with my pen from my heart. A Tortoise New Year to You! Three times I saw this humongous tortoise on the side of the road as I drove my daily work route. One day he was in the middle of a grassy field and people were all around him taking pictures. How curious, I thought, but I didn’t stop. Another time I saw him as I rushed back to work with my lunch. This time he was in the parking lot of the gas station on the corner and two old men were blocking him from crossing the busy highway. Again, people were taking pictures of him. Not your every day sort of thing in the city surrounding Charleston, SC for sure! My curiosity peaked and I remembered to mention this strange occurence to coworkers when I got back to the office. We wondered how such a creature was just wandering around and worried he would get hit by a car. On my way home that day he was still there at the gas station with the old guy standing by his side hours later. This time I became one of the curiosity seekers and stopped to take his picture. His two foot long frame and calm sauntering through the parking lot amazed me. I really was worried some terrible fate would befall him in the big, wide civilized world of North Charleston so I asked the old man about him. As it turns out the tortoise is his pet and he takes him around the city in the nearby trailer he pointed out to me for people to see. He said he has an animal rescue and this is one of his rescues, an African tortoise. Of course, he accepts donations so I gave him some money and snapped a few pictures. I was glad he wasn’t lost anyway and in no danger of being hit by a car. I do hope I have the ability to notice such unexpected surprises in the new year. I could really use a tortoise-paced 2013, slowing down enough to enjoy the simple things sauntering through my days. I wish the same for you! May we all be blessed with joyful surprises along the journey this year! In this time of Lent when self-denial, repentance for wrong-doing, and self-examination become the clarifying force of humble pray-ers, I can only hope that through the mercy and grace of God, He will hear my prayers for others and that in spite of troublesome me those prayers for healing will bear fruit. Life is full of challenges to bear and overcome and I am lost without the saving grace and peace I have found in Christ. I just finished Brennan Manning’s All is Grace that I got last weekend on a women’s retreat. In his words, “My message, unchanged for more than fifty years, is this: ‘God loves you unconditionally, as you are and not as you should be, because nobody is as they should be.’ ” God can make us better than we are and I don’t know about you but I am still a work in progress! …my favorite writing and thinking spot.